New to spectroscopy? Want to share your excitement with your friends? Tom is now available to give presentations at one of your club meetings. His talks are a great introduction into the field: link. Yahoo RSpec Users group: The RSpec user group has some very knowledgeable members. This is a good place to ask questions about RSpec or spectroscopy in general. If you have questions about what equipment you need to get started, check out our Getting Started page. RSpec comes with a complete set tutorial videos. You can view them in the program from its Help | Video Library menu. Even before you download and install RSpec, you can view the tutorial videos online here. Robin Leadbeater is the designer of the Star Analyser grating. Robin’s creativity, skill, and passion, as well as tireless contributions to the amateur community, have had an enormous impact on the evolution of astronomical spectroscopy. His site is a gold mine of wonderful examples and tips. Don’t miss it, or the Star Analyser Yahoo Group: link. Hands on workshop: Even while you’re waiting for clear skies or your new diffraction grating to arrive, you can begin learning RSpec (even with just the free trial version!). This page (link) has a YouTube video of a hands-on workshop given to the AAVSO by Tom Field. There are also sample files there that you can download so you can follow along step by step. This is a great way to get started. Yahoo Amateur Spectroscopy: This group is for the discussion of amateur spectroscopy topics including equipment, techniques, calibration, data acquisition and data analysis. Yahoo Astronomical Spectroscopy: This group is focused on supporting amateur astronomers interested in Spectroscopy. Its aim is to provide resource material and assistance to both the novice and the more experienced amateur. Yahoo Astronomical Amateur Spectroscopy. This is a combination of French and English group. Christian Buil’s site contains a wealth of very helpful information about spectroscopy. Christian is one of the leaders in the field. He’s a pioneer who frequently leads the way into new technologies. His site has countless examples of the kind of deep, high-quality, scientific work that he does. Paton Hawksley Education Ltd: manufacturer of the Star Analyser grating spectroscope for astronomers. We sell this grating here: link. Rainbow Optics: manufacturer of the Star Spectroscope 200 l/mm grating. Amateurs have gotten good results with this grating. However, having twice lines/mm doesn’t mean that it’s “twice as good!” In fact, the SA-100 was deliberately designed with the lower 100 l/mm dispersion because this makes it more likely that you can include the star image in your spectrum images. This makes calibrating your spectra considerably easier. We offer a Star Analyser 200 line/mm grating that has a better design for those situations that it’s needed. For our more detailed discussion of these gratings, see this link. David Haworth, like some others listed here, has been doing high-quality spectroscopy for more than ten years. He has a great site with lots of good information and links to other sites. His site also has the details on how to do solar spectroscopy with a Star Analyser. Ken Hudson does a really great job in blogging a wide range of astronomy topics. Check out his blog at this link. For more flexibility in your telescope activities, you can mount a Star Analyser and other devices on a Rotarion rotator. 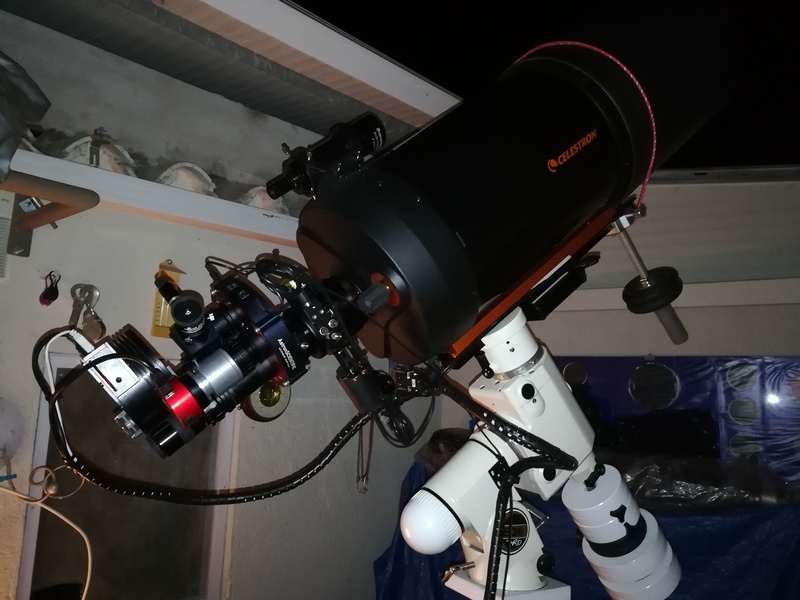 Here’s an example of a Rotarion that’s configured for a variety of activities, including a ZWO camera with a Star Analyser: link. Here’s their site: link. We don’t want to talk you out of buying books, but we wanted you to know that getting started is so easy that you may not need any of these books. Take a look at our on-line calculator (link) to easily determine how to mount a Star Analyser grating. Then simply review the first few videos on our video page (link). We’re always available via our Contact Form (link) to answer questions. Don’t be shy about asking. The Inglis, and Robinson books are helpful in understanding the science of spectroscopy. But we think you’ll be surprised at how easy it is to get started without a lot of complicated reading. Spectral Atlas for Amateur Astronomers, Richard Walker – This is very nice, large, color-format text of Walker’s popular atlas. Featuring detailed commented spectral profiles of more than one hundred astronomical objects, in color, this spectral guide documents most of the important and spectroscopically observable objects accessible using typical amateur equipment. It allows you to read and interpret the recorded spectra of the main stellar classes, as well as most of the steps from proto-stars through to the final stages of stellar evolution as planetary nebulae, white dwarfs or the different types of supernovae. This book also presents integrated spectra of stellar clusters, galaxies and quasars, and the reference spectra of some terrestrial light sources. Whether used as the principal reference for comparing with your recorded spectra or for inspiring independent observing projects, this atlas provides a wonderful and educational view into our Universe’s past. Amazon link. We recommend the hard copy rather than the Kindle version because this is a book with a lot of large images. Note that because the spectra illustrated in this book are captured with a slit device with higher resolution than that achieved by a slit-less grating, not all of the spectroscopic features will be visible with a Star Analyser. Don’t let that dissuade you from purchasing this book – in Tom’s opinion, it’s one of the best for learning about astronomical spectra, especially if you’re capturing them yourself. Spectroscopy: The Key to the Stars: Reading the Lines in Stellar Spectra (Patrick Moore’s Practical Astronomy Series), Keith Robinson – Great book! One of my favorites. Very little math. Explains the physics behind stellar spectra. Amazon link. Practical Amateur Spectroscopy, Stephen Tonkin – A bit dated, but still useful. Amazon link. Astrophysics is Easy! An Introduction for the Amateur Astronomer Patrick Moore’s Practical Astronomy Series), Mike Inglis – A bit more technical, but still very accessible reading, in spite of the lame title! I re-read this book periodically and always learning something new. A great addition to your library! Amazon link. Starlight: An Introduction to Stellar Physics for Amateurs (The Patrick Moore Practical Astronomy Series), Keith Robinson – Starlight provides an in-depth study of stellar astrophysics that requires only basic high school mathematics and physics, making it accessible to all amateur astronomers. Starlight teaches amateur astronomers about the physics of stars and starlight in a friendly, easy-to-read way. The reader will take away a profoundly deeper understanding of this truly fascinating subject – and find his practical observations more rewarding and fulfilling as a result. Amazon link. Observer’s Guide to Stellar Evolution, Mike Inglis – Another good entry-level book that covers the fundamentals. This is also one of my favorites. Amazon link. Measuring the Universe: The Cosmological Distance Ladder (Springer Praxis Books / Space Exploration), Stephen Webb – This is a great book! It’s a bit technical and a decade old, but don’t let that get in the way! It’s a wonderful overview of how we calculate very large distances. It starts out with parallax that is used on nearby objects. And it concludes with how we measure the most distant objects in the universe. I keep coming back to this book because it incorporates so many different disciplines in astronomy. And, of course, spectroscopy plays a big part! Amazon link. “… fills a huge need by providing a spectacularly good discussion of stellar spectra. With a highly detailed and digital view of the modern art of classification… there is not much on the subject that one cannot find in this well-written and richly illustrated volume.” Amazon link. A Spectroscopic Atlas of Bright Stars: A Pocket Field Guide (Astronomer’s Pocket Field Guide), Martin – Two pages for each of 54 stars. For each star, there is a spectrum and profile graph with key features called out. Amazon link. The Sky is Your Laboratory, Robert Buchheim – This book touches on spectroscopy, but also has a wide range of other interesting projects. I’ve included it here because it is aimed at amateurs who, like you, are interested in data. You’ll find it has a very readable discussion in the how-tos in a variety of projects, including chapters on astrometry, photometry, variable star observing, occultations, meteors. When necessary, the author includes very accessible math that may be necessary for understanding the projects and approaches. There should be more books like this! Amazon link. The Revival of Amateur Spectroscopy, Maurice Gavin – This is a free, on-line article from more than ten years ago by one of the original amateur spectroscopers who recently passed away. Link. “[This book] begins by introducing the reader to the fundamental properties of stars and the formation of spectra, before proceeding to the concept and history of stellar classification. The following chapters each look at a different star type: starting with cool M, the discussion extends to cover new stellar classes L and T, before advancing through type O to finish with extraordinary classes.The book concludes with a skillful integration of all the data, tracing the evolution of stars and their place in the Universe. With modern digital spectra and updates from two decades of astronomical discoveries, this accessible text is invaluable for both amateur astronomers and students.” Amazon link. Novae & Spectroscopy, François Teyssier – Free, online article is a good resource on, well, … you guessed it: novae and spectroscopy! This is a computer-generated translation from French, so it’s a bit unpolished but readable. Thanks, François for this valuable article! Scientific Astrophotography, Gerald R. Hubbell – The subtitle of this book says it all: “How Amateurs Can Generate And Use Professional Imaging Data.” Although this book only has a short section on spectroscopy, we recommend it for anyone doing any kind of astronomical imaging. Hubbell has pulled together in 330 pages a comprehensive and valuable discussion of all aspects of imaging. “The structure and methods described in Scientific Astrophotography provide you with the opportunity to take a fresh approach to this discipline of study and put what you have learned to use in a a real-world activity…. Hubbell lays down a road map to penetrate and methodically correct the root causes of problems often encountered when acquiring images that will allow you to obtain high-quality data that can be used in research… The book also has detailed descriptions of how to complete each step along the way, full descriptions of how and why things work they way they do, and forms to record your notes, which are so critical to research.” Amazon link. Resolution limitations, Doug West – At a certain point, increasing a grating’s lines/mm or distance from the sensor in a slit-less system produces no increase in resolution. If you’re thinking like I did early-on, of trying a 300 or 600 line/mm grating, West’s paper may convince you that it’s not worth the effort. Link. Astronomical Spectroscopy for Amateurs, Ken Harrison – This is a helpful book. Ken is a leader in the amateur community with a great deal of experience is all aspects of the field. His book contains a lot of background information for the beginner as well as the more experienced amateur spectrographer. Grating Spectroscopes and How to Use Them (The Patrick Moore Practical Astronomy Series) , Ken Harrison – In this follow-up book, Harrison continues to offer valuable practical advice on getting started with a small telescope or even a simple DSLR. See RSpec in the news: link.